Keep children safe while they play in a driveway, parking lot, or road. 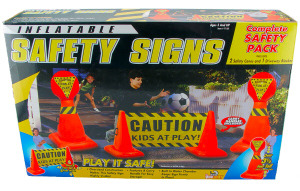 The Inflatable Safety Sign Set includes 2 safety cones and 1 driveway blocker which are bright orange and yellow in color so motorists can see children from a safe distance. The 2 safety cones stand 3.5 feet tall; the driveway blocker is 2 feet tall and 4 feet long. All have a bright, highly visible sign which reads CAUTION KIDS AT PLAY. Simply inflate the units with air except for the base chamber which takes sand or water to keep them firmly in position. Carry handles on all units make for easy use and storage.